Where Compassion Is At The Heart Of Our Care. 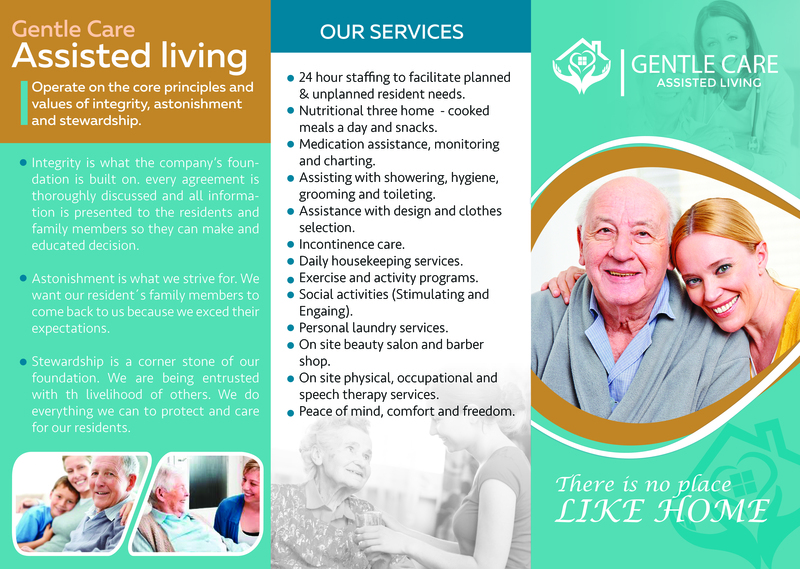 Gentle Care Assisted Living Operate on the core principles and values of integrity, astonishment and stewardship. Integrity is what our foundation is built on. Every agreement is thoroughly discussed and all information is presented to the residents and family members so they can make and educated decision. Astonishment is what we strive for. We want our resident´s family members to come back to us because we exced their expectations. Stewardship is a corner stone of our foundation. We are being entrusted with th livelihood of others. We do everything we can to protect and care for our residents. 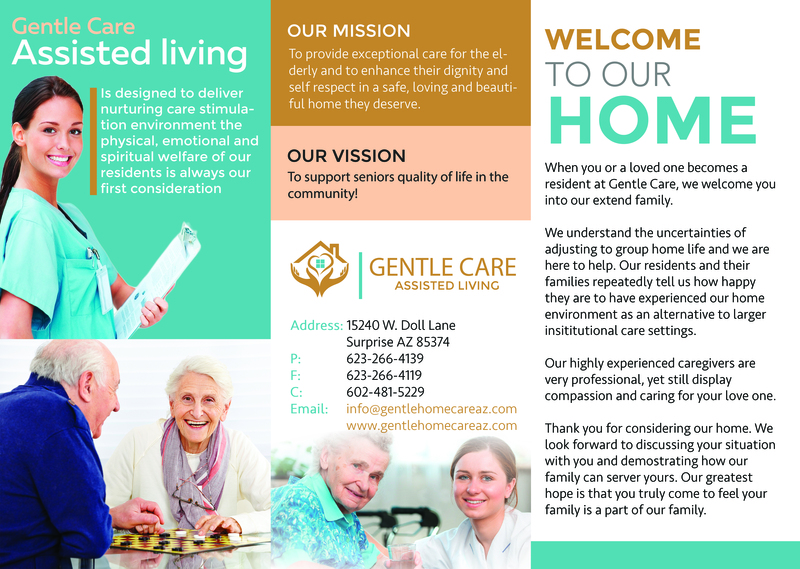 When you or a loved one becomes a resident at Gentle Care, we welcome you into our extend family. We understand the uncertainties of adjusting to group home life and we are here to help. Our residents and their families repeatedly tell us how happy they are to have experienced our home environment as an alternative to larger insititutional care settings. Our highly experienced caregivers are very professional, yet still display compassion and caring for your love one. Thank you for considering our home. We look forward to discussing your situation with you and demostrating how our family can server yours. Our greatest hope is that you truly come to feel your family is a part of our family. Provide exceptional compassion care for the elderly and to enhance their dignity and self respect in a safe loving and beautiful home they deserve. To Support seniors quality of life in the community . Our Residents receive 24-hour care for their individual physical and emotional needs. Our caring staff assists residents with all activities of daily life from light support to daily comprehensive care including: dressing, bathing, personal hygiene, and incontinent care. We are committed in offering enjoyable activities based on our residents needs and interests. Daily Exercise Program, Celebrated Holidays, Birthday Parties, Movies with Snacks, Arts and Crafts, Book Reading, Discussions on All Topics, Bingo, Puzzles, Story Telling, Residents Share Experiences, Current News, Debate Gardening, Live Entertainment, Bar-B-Que outdoors, Church Services, Field Trips, and More..
We serve a variety three courses and gourmet style meals and snacks. Nutritional value according to the individual dietary needs, balanced meals and snacks. All meals are made from scratch. Is there a posted current license, with the facility’s correct address, from ADHS? What are resident to staff ratios? Is there a certified manager on duty? Are caregivers available 24 hours a day? Can residents continue to see their own doctor? Are the grounds and the building(s) neat and clean? Is the menu balanced and appealing? How much time do residents have to eat their meals? Do they have substitutes if a resident does not like the meal? Do staff know residents by name? Are residents wearing appropriate seasonal clothing? Are residents able to bring their own furnishings for their rooms? What is facility policy on holding a bed if a resident leaves the home for hospitalization or vacation? How close is the location of the home to family and friends? Ask for a "typical profile" of a resident in their facility. Are residents alert or confused? Match the facility to the resident. Are residents permitted to have visitors at any time? Are resident permitted to access to the outdoors, get beverages, use the telephone, rest, etc. on their own? Can residents go to bed at night and get up in the morning when they choose? Who arranges doctor appointments and manages resident medication? Are resident rooms decorated with personal belongings? Are relationships between staff and residents warm and friendly? Are there communication barriers between staff and residents? What is your emergency hospital? Does the facility accept VA benefits or waivers? Does the facility accept long-term care insurance? Copyright © 2017 Gentle Care Assisted Living - All Rights Reserved.